Please note that our Jackpot now stands at a Whopping €10,600. Now is the time if you are not already signed up to register. Not only are you helping your club but you are in with the chance of a great win. There was no Match 4 winner of the Club Lotto on Friday, 14th November when the numbers drawn were 13, 15, 23 and 26. It is €2 per week but goes a long way towards running all the facilities that we have. Sean O’Neill gets the lucky dip. Further details are available at www.brayemmets.com. 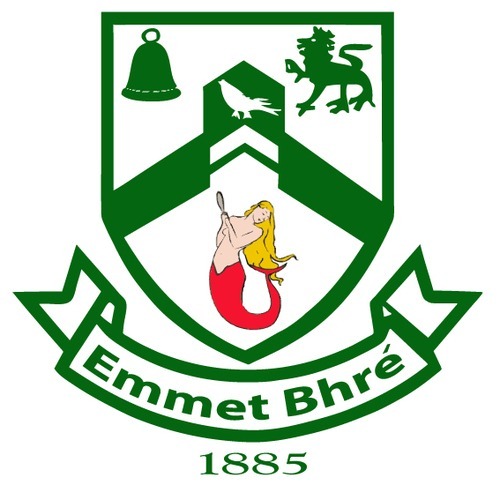 Bray Emmets GAA Club will be holding the 2014 Annual General Meeting (AGM) on Friday, 28th November, 2014 at 7.30 p.m. in the Clubhouse. Strictly between us do you want to dance??? Bray Emmets is holding a Strictly Come Dancing Competition on 21st February 2015. We are now looking for men and women to strut their stuff. If you think you have what it takes email [email protected] Or ring/text Dee Kearney 086-1698928 by 19/11/2014. If you don’t want to dance but would like to help out on the committee just drop us an email/text to the above details. Bray Emmets were very well represented by 15 musicians and singers in Scór na nÓg again this year. The competition took place in Ballinakill in the Wicklow centre of Excellence. The following people, also highly involved with the talented Bray Comhaltas, took part in the group section. Grúpa 1. Rachel Ní Chuilinn, Sadhb Ní Bhroin, Matthew Booth, Patrick Haugh, Sadhb Dodd. Grúpa 2. David Nesbitt, Brian Nesbitt, Eoin Mac Siomóin, Eoin Mac Thomáis, Oisín Drury. Grúpa 3. Elena Ní Chéidigh Hayes, Emma Doyle, Rian Mac Maoláin, Róisín Ní Mhurchú. Brian Nesbitt, an U12 Hurler and Footballer entered the singing category. Group 2 involving David Nesbitt, Brian Nesbitt, Eoin Mac Siomóin, Eoin Mac Thomáis, Oisín Drury were very successful. Those 5 dedicated musicians now go on to the semi-finals in December in Parnells GAA club, Dublin. Despite the rain, a very enjoyable night was had by all involved with the inviting refreshments proving to be just the tonic. The parents were very appreciative of the organisers and the generosity of their work on the night. B’fhéidir go bhfuil sé in am dúinne a leithéid de chomórtas a eagrú in Emmet Bhré. On Sunday, 23rd November, Bray Comhaltas organised a very successful Music session for their young members upstairs in the Bray Emmets clubhouse. There were over 50 people in attendance, 30 young musicians along with another 20 family members in support. The music was lead by Rachel Cullen and Sadhbh Byrne between 3.00 and 5pm. The organising parents were delighted with the success of the occasion and very appreciative of Bray Emmets and in particular, Ger Conroy who obliged in locking up. Beidh neart ócáidí eile againn amach anseo le cúnamh Dé. Club Shop is open on Wednesday 26th Nov, 7 – 8pm. Please come along and we can put away anything you need for Christmas. NEW JERSEY is in stock If we don’t have something on the evening we can order and have in time for you. Tea and coffee available on the night and maybe even a mince pie. Look forward to seeing you all. Linda and Brenda.